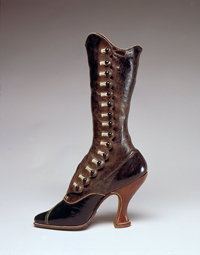 Curvy, red-lined leather “it” boot of 1900 by Jack Jacobus Ltd. Austrian fashion, gift of the V&A. As part of FIT’s program in Fashion and Textiles Studies, the grad students have mounted a gem of a show about fashionable footwear — Boots: The Height of Fashion, running just a few days more. The museum’s side gallery tells an interesting story about how boots went from practical to glam, and from guy wear to girl fashion, beginning with some thought-provoking high-buttoned “look at me” boots from 1900, following on to the boot-clad flappers, and taking us straight through boot history to the heyday of the Warhol factory. The students have rummaged through the FIT collection to show us their picks to demonstrate “boots as a second skin” (David Evins, Charles Jourdan, and silk Louboutins), the rebel look, fashion-tribe style, and over-the-top luxury. Fantasy-meets-luxury suede and shearling creation by Manolo Blanik (1997, UK). Gift of Ruffo. 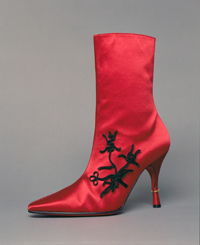 Among our favorites are the 1922 Ball Brand flapper galoshes and everything from the collection of Warhol superstar Baby Jane Holzer – 1963 Davide Beatle boots, 1969 Guccis, and 1971 embroidered boots from The Chelsea Cobbler. The students also gave us a behind-the-scenes look with two cases about boot conservation. One case features pairs of boots (baby boots and high-buttoned shoes) with one shoe “conserved” and the other in its deteriorating state. The second case shows how the museum is preserving those famous “second skin” David Evins polyurethane leggings from 1960s, which sadly have broken down due to the atmosphere and light.